Heat water in a pan,bring to boil.Now add the soya chunks and close the lid for 5 to 10 mins. Then drain all water,rinse the soya chunks in cold water. Repeat the process till raw smell goes from it. Finally squeeze and keep aside. Cut in to small bite pieces. Heat oil in pan,splutter Cinnamon and cloves. Add the tomato next to it.Fry for 2 more mins. Put the green peas,add little water and close the lid.Cook it for 2 to 3 mins. Then add ,soya chunks mix well. Add the ground paste and required water,close the lid again. Check salt.Cook it in medium flame for 5 mins. Once it done add cilantro and curry leaves on top. 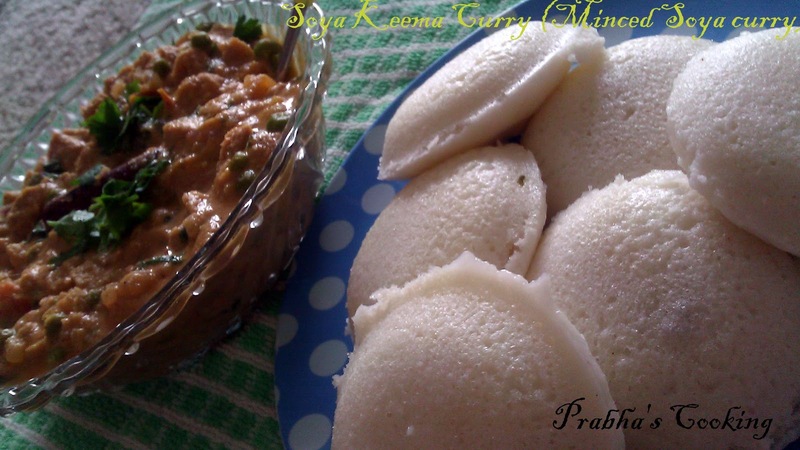 Serve hot with Idly/Dodai ..
Can add any desired vegetable to the kurma. Instead of adding chopped soya chunks you can grind in to course and add to the curry. Serve with any type of tiffin (or) Rice items. Sending this recipe to Vardini's "Dish it out"
spicy and delicious kurma.. looks perfect !! 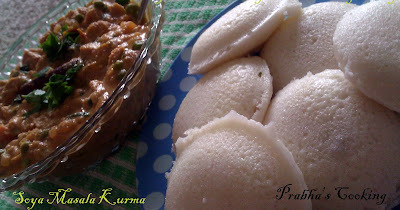 Delicious kurma,looks so inviting with those idlli. 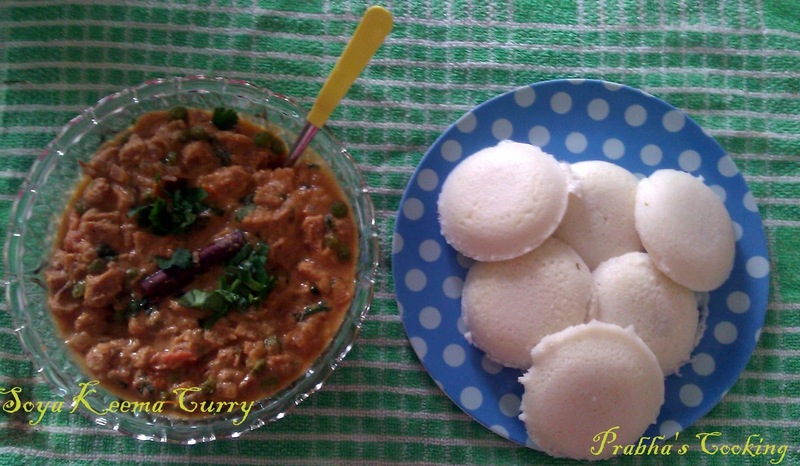 lovely recipe...kurma looks spicy and yummy!! Kurma looks very tasty. Yumm! 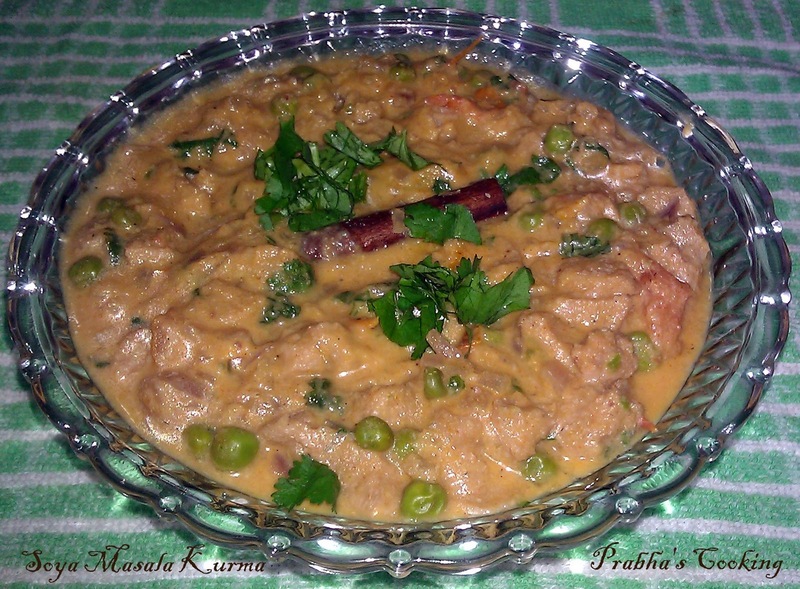 tried this kurma, i used mushroom and peas and did exactly as your recipe and the kurma came out really good and i liked it a lot. i served with chapathi that was also a yummy combo...thanks for sharing!!! I tried this soy kurma really good.